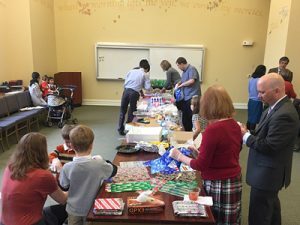 Campus Ministry volunteers, young and old alike, help assemble donated cookies to share with college students during their final exams. Do you have a passion for baking? Shadyside Presbyterian Church (SPC) once again will be sharing cookies with college students as they study for their final exams. The Campus Ministry Mission Action Community (MAC) invites you to bring cookie donations to the church on Sunday, April 28, for distribution during the week of April 29. Would you like to help us spread the love on campus? Please contact the church office for more information.